You already know that taking care of your teeth can help prevent tooth decay and the need for extensive work such as root canals or implants, which can be inconvenient and expensive. But the benefits of good teeth can go far beyond having an attractive smile and being able to crunch carrots and chew meat. The American Dental Association explains that healthy teeth are linked to a lower risk for heart disease and diabetes. Furthermore, recent research published in the British Journal of Sports Medicine states that good teeth can improve athletic performance among elite athletes. Researchers examined the oral health of nearly 300 athletes in 25 sports at the 2012 Olympics in London. They looked for conditions such as dental caries, gingivitis, dental erosion, and periodontal disease, and asked about recent visits to a dentist. Study investigators also asked athletes whether their oral health interfered with quality of life or athletic training and performance. The study concluded that poor oral health and fewer dental visits led to interference with preparation for competition. 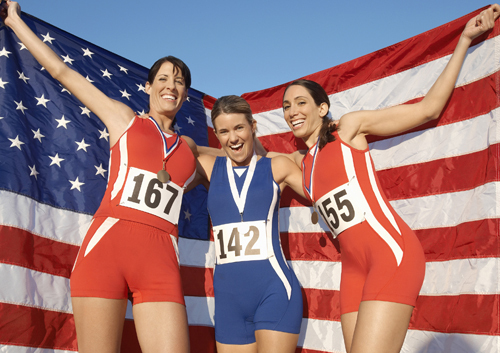 Unfortunately, merely taking good care of your teeth won’t turn you into an Olympic gold medalist. However, the benefits can still be worthwhile. Even if healthy teeth provide little if any detectable gain in your athletic abilities, the potential benefits of maintaining a healthy mouth clearly go far beyond an attractive smile. Practicing good oral hygiene and seeing Dr. Robert Klein regularly can promote your physical health, and maybe – just maybe – you will start to achieve an advantage over your weekend athletic opponents.